The Rev. Michael Jossel remembers excitement about the mule train when he was a teenager. He says people were caught up in the belief that change was going to come, and willing to get fired for supporting the campaign. 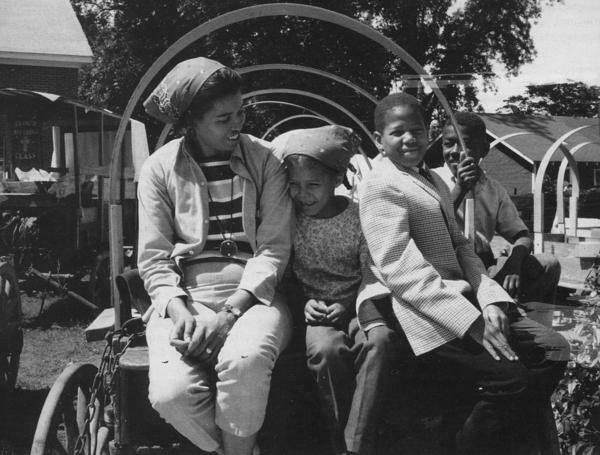 Joan Cashin, her daughter Sheryll, and two unidentified local boys wait to help waterproof the wagon covers in Grenada, Mississippi. The Rev. 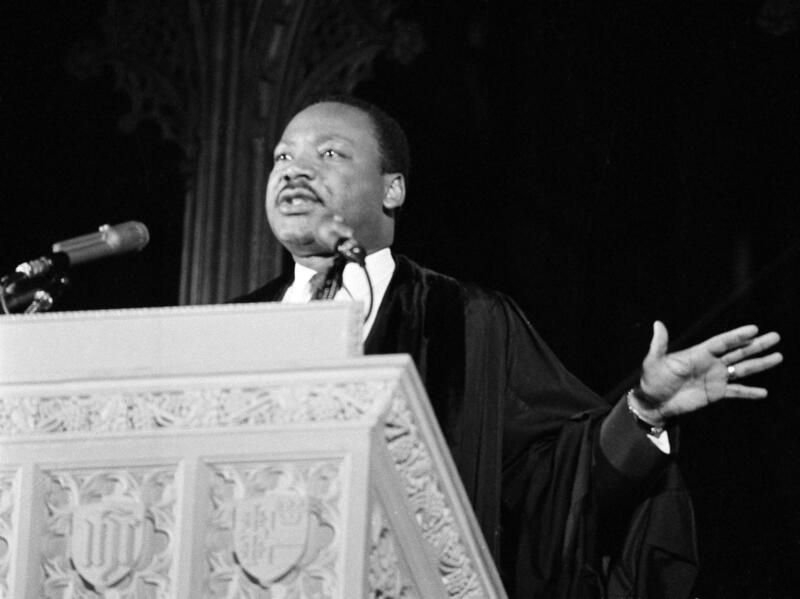 Martin Luther King Jr., addressing the audience from the pulpit of the National Cathedral in Washington, D.C., on March 31, 1968, where he discussed his planned poor people's demonstration. Betty Crawford, Bertha Burres' cousin, recently moved back to Marks. 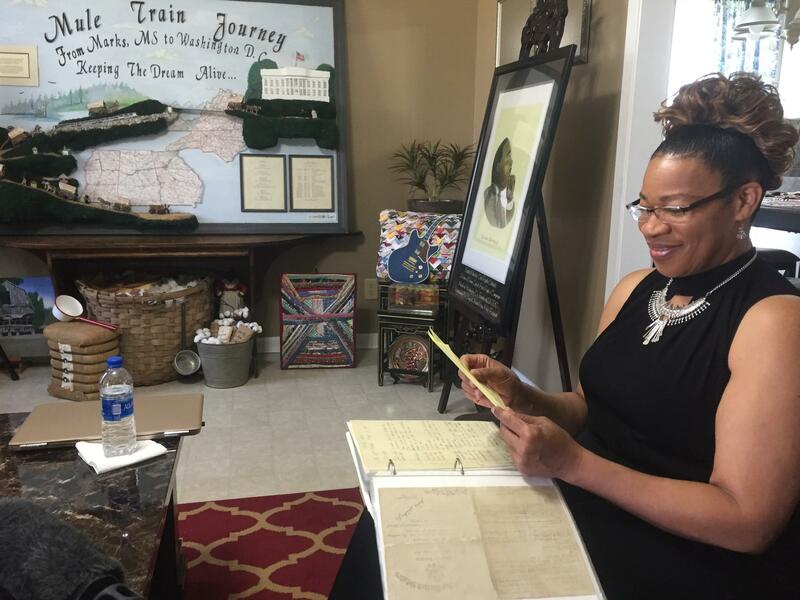 Her home is filled with original art depicting the mule train, and she's preserving journals Burres kept during the historic journey. Julia Mayweather remembers attending mass meetings for the Poor People's campaign in Marks 50 years ago. She says Martin Luther King would be disheartened by conditions there today. Marks is now a stop on Mississippi's Freedom Trail highlighting civil rights history. Local officials hope to draw tourists to the area as a way to spark more business. Fifty years ago today, a mule train left the small town of Marks, Miss., bound for the nation's capital. They were answering a call to action the Rev. Martin Luther King Jr. made just days before he was assassinated. "We're coming to Washington in a poor people's campaign," King announced at the National Cathedral in Washington, D.C., on March 31, 1968. "I was in Marks, Miss., the other day, which is in Quitman County, the poorest county in the United States. And I tell you I saw hundreds of black boys and black girls walking the streets with no shoes to wear." The civil rights leader described being brought to tears by the conditions he found in the Mississippi Delta — a flat expanse in the northwest part of the state with rich alluvial soil along the Mississippi River. That's why he picked Marks as the starting point for the Poor People's Campaign — a multiracial coalition of poor people who would occupy the national mall and demand economic justice. "Bring the poor to Washington"
Long after slavery ended, black sharecroppers remained on Delta plantations working as tenant farmers. "The bottom line was hunger, hunger, hunger," says Children's Defense Fund founder Marian Wright Edelman, who was doing legal work in Mississippi during the 1960s. "You go up in the field and you would just see the hungry children and the bloated bellies," she says. Edelman recalls King touring a Head Start program in Marks that lost its funding. "He saw a teacher, you know, carve up an apple and give it to about eight kids — a slice each — and he was in tears," she says. "He had to leave the center." Edelman brought members of Congress, including Sen. Robert Kennedy, to see the deprivation firsthand, but got little traction on poverty programs. She says Kennedy encouraged her to get King to put more focus on the issue. She says he loved the idea. "I told him that I'd just seen Robert Kennedy and he had seen the hunger of children in Marks," Edelman says. "Kennedy said bring the poor to Washington and he lit up like a lightbulb." From there King moved forward on organizing the Poor People's Campaign. "The vision was that this mule train would go all the way from Marks Miss., the poorest hamlet in the poorest state of the country, all the way to Washington," says Georgetown University law professor Sheryll Cashin. "The mule and the covered wagons as a symbolic message of the black sharecropper." Cashin keeps a steel mule bit and leather harness as a memento from the mule train. She went to Mississippi as a child with her parents, civil right activists Joan and John Cashin, who helped organize the Poor People's Campaign. "Financing, locating the mules for the Mule Train, and actually going down to Marks, Miss., helping to assemble the trains," she says. "We were tired of living the way we were living"
After King was assassinated, preparations for the journey continued. 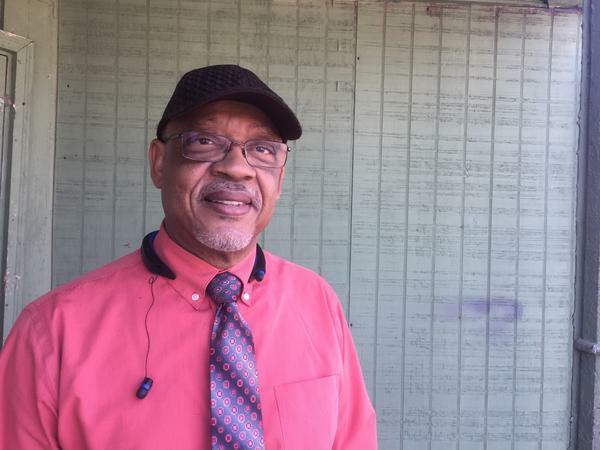 "I'm going to take you to where the mule train was organized," says the Rev. Michael Jossel as he drives through Marks, pointing out a grassy field on the edge of town. Jossel was 14 years old in 1968. High school students would help in the afternoons and then march into town every evening. "To bring attention to the Poor People's Campaign," he says. "To just bring attention that we were tired of living the way we were living." Jossel says the campaign gave people a sense of hope that change might come. But it came at a price. When students marched to the jail to protest the arrest of an organizer with the Southern Christian Leadership Conference, they were met by armed troopers. "They parked on this side of the street with their helmets and guns, and lined up in a single file, and started marching across the street to where we were," he says. "They took the butts of their guns and started swinging at heads and everything, and we scattered like bees." "You went, you went at your own risk," says Samuel McCray, who was also in high school at the time. McCray says teens were more willing to participate than older residents, who stood to lose their jobs and homes. "The plantation system ran the state of Mississippi. It certainly ran the Delta," he says. "It was an oppressive system." McCray had been working the cotton fields since he was six. His grandmother allowed him to help locally, but not ride the mule train to Washington. He says there was great fear at the time. "A lot of the parents didn't know there was a better way," he says. "You saw Dr. King and he's fighting for us, but then they killed him. So if they can kill him then what about you?" Still enough people joined from around the South to send several busloads, and then on May 13, a caravan of about 15 covered wagons, painted with slogans such as "Jesus was a Poor Man" and "Feed the Poor" pulled out of town. Bertha Burres and her six kids were among them. She talked to SCLC photographer Roland Freeman along the journey. "We have a great purpose," she said on tape recordings Freeman shared with NPR. "We are in great need of jobs – a job that will secure us to help us bring up our family with the right kind of food and clothes for the different seasons." Burres served as the record keeper for the SCLC. She suffers from dementia now, but her cousin Betty Crawford is organizing those papers for preservation. The journals detail every stop, and describe rain storms, wagon repairs, and run-ins with law enforcement along the way. "Seventh stop, Eupora. Our first encounter of trouble," Crawford reads from Burres' handwritten entry. "We were stopped east of Eupora by sheriff deputies." Crawford recently moved back to Marks, and her home is filled with her original art depicting the mule train's journey. She cherishes the history. "I grew up here in Marks, grew up in poverty," she says. "I come from a family of 16." Betty Crawford's home in Marks today is very different from her days growing up, waiting her turn for a pair of shoes, battling worm outbreaks, and living in sparse housing. "I was 16 years old before we got inside plumbing," she says. "Before we had a house with running water." But she says they never went hungry thanks to government commodities, her dad's hunting and fishing, and what she calls a truck patch – a large garden plot on the plantation where the family raised vegetables. "It gets a bad rap"
Crawford and others who lived in Marks 50 years ago say they really didn't know how poor they were, but they knew who was in control. The mule train brought a new sensibility — that it was possible to rise above those circumstances. As Jim Crow was dismantled, barriers to voting came down. 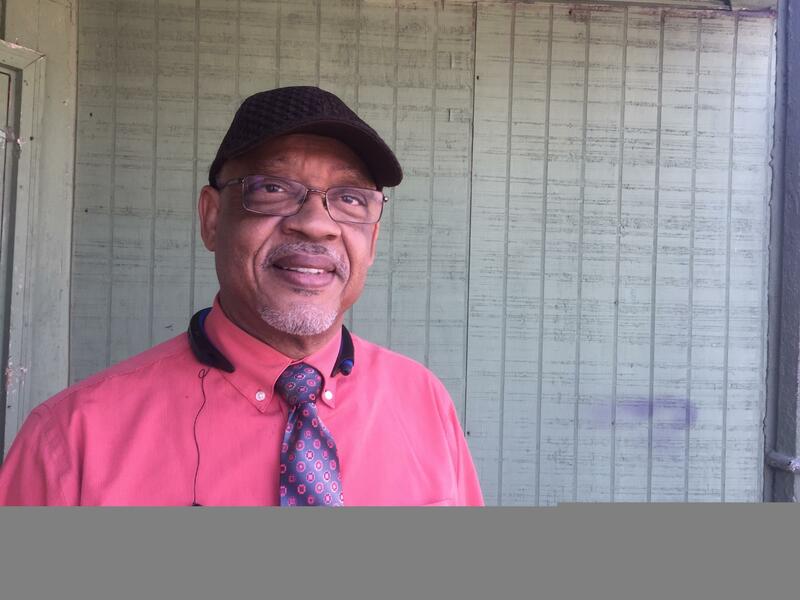 Now African-Americans have significant political clout in the Delta. But economic power has proven more elusive. Marks, population 1,500, still struggles with poverty today. "It gets a bad rap," Samuel McCray says. "It is economically deprived. It's a misnomer to call it poor. We have a lot of people who are in poverty and there are real concrete reasons for that." Farm jobs are mostly mechanized now, and smaller businesses have left downtown Marks. Two major employers here – a cotton compacting plant and a seed oil press have shut down. Quitman County remains on the federal list of the nation's persistent poverty counties. More than 34 percent of residents live below the federal poverty line. Betty Crawford checks on an elderly widow in her neighborhood. "Coming in," she hollers as she walks through the wrought iron storm door on Julia Mayweather's modest wood clapboard house. The white paint is fading outside and there are holes above the window frames. Inside, Mayweather warns Crawford to watch her step and avoid the spots where the floorboards have rotted out. You can see through to the ground below. "I usually kind of get over here," she says. "Step over to this side." A retired school cafeteria worker and bus driver, Mayweather hasn't been able to keep up with repairs since her husband died. She didn't join the mule train, but participated in the mass meetings in the Spring of 1968 to plan the Poor People's Campaign. She thinks Martin Luther King would be disheartened to see Marks, Miss., today. "He would say worse than what it was," Mayweather says. "We don't even have a grocery store in Marks." And she says health care is hard to come by. "Used to have a hospital. It's gone." The hospital and an old SuperValu sit empty on the main highway. Emergency medical care is 20 miles away. Convenience and dollar stores are the local options for groceries. On a residential street at dusk, Irene Wilson, a thin wisp of a woman, is pushing a grocery cart full of aluminum cans she's been collecting to sell for cash. "Trying to get me something to eat cause I am hungry," she says. "I haven't ate all day." She's 53, and says she draws a social security disability check and gets food stamps, but still struggles to get by. "I don't want to be here," she says. "But this is where I was born and raised so I got no other choice but to live in it." In 1968, the mule train from Marks made it to Atlanta where the whole caravan was loaded onto a rail train bound for Alexandria, Va.
On June 19, the wagons crossed the Potomac and joined thousands of people from around the country to live in a shantytown known as Resurrection City that occupied the national mall for six weeks. This month Amtrak added a stop in downtown Marks. It's part of a strategy to develop the region as a tourist destination. Quitman County Administrator Velma Benson-Wilson says the history of the Poor People's Campaign and its significant role in the civil rights movement has been buried here for too long. "How can we use it to help Quitman County maybe dig itself out of the some of the poverty?" she asks. "There has to be a way." She says what started here 50 years ago helped people around the country when Congress passed nutrition and housing programs. "They were all rooted in what started here in Marks in 1968," Benson-Wilson says. "Somehow we have not been able to tell that story." 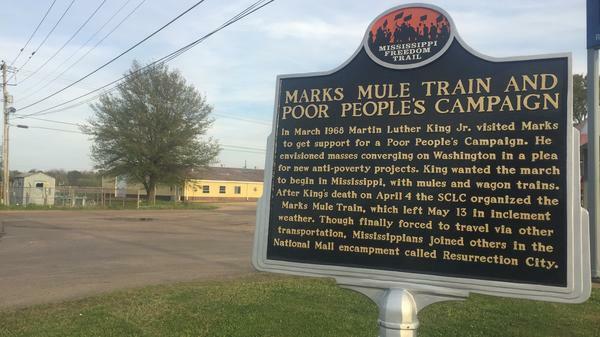 Fifty years ago today, a mule train of covered wagons left the small town of Marks, Miss., headed for the nation's capital. It was fulfilling the mission of the Rev. Martin Luther King Jr. to draw attention to the impoverished conditions that many African-Americans lived in. MARTIN LUTHER KING JR.: We're coming to Washington in a poor people's campaign. 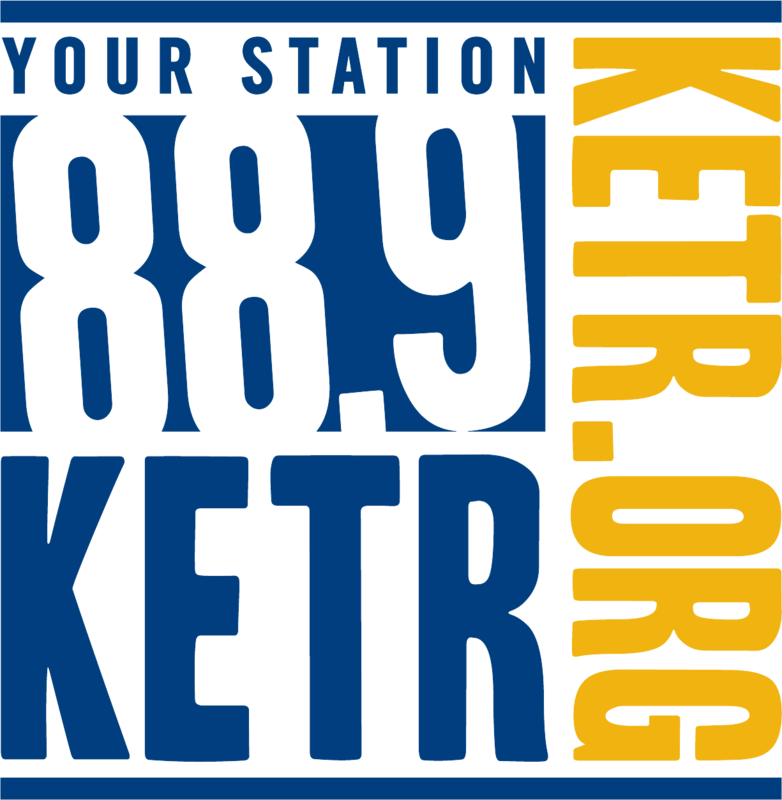 GARCIA-NAVARRO: As part of our series looking at how events from the 1968 shaped our country, NPR's Debbie Elliott has a look at Marks, Miss., then and now. DEBBIE ELLIOTT, BYLINE: Martin Luther King Jr. picked Marks, Miss., as the starting point for the poor people's campaign because of what he had witnessed there. KING JR.: I tell you I saw hundreds of little black boys and black girls walking the streets with no shoes to wear. ELLIOTT: King was speaking at the National Cathedral in Washington D.C. on March 31, 1968. He described being brought to tears by conditions in the Mississippi Delta, a region where, long after slavery, black sharecroppers remained on plantations working as tenant farmers. MARIAN WRIGHT EDELMAN: The bottom line was hunger, hunger, hunger. And you go up in the field, and you would just see the hungry children and the bloated bellies. ELLIOTT: Children's Defense Fund founder Marian Wright Edelman was doing legal work in Mississippi in the 1960s. She recalls King touring a Head Start program in Marks that lost its funding. EDELMAN: And he saw a teacher, you know, carve up an apple and give it to about eight kids - a slice each. And he was in tears. He had to leave the center. ELLIOTT: Edelman brought members of Congress, including Sen. Robert Kennedy, to see the deprivation firsthand but got little traction on poverty programs. She says Kennedy encouraged her to get Martin Luther King to bring the poor to Washington. And King loved the idea. He organized a Poor People's Campaign, a multiracial coalition of poor people who would occupy the National Mall and demand economic justice. It would start from Marks, Miss., with a mule train and a nod to the plight of the black sharecropper. MICHAEL JOSSEL: Now I'm going to take you to where the mule train was organized - OK? ELLIOTT: The Rev. Michael Jossel was 14 years old in 1968. He drives through Marks, pointing out the grassy field where the wagon train assembled. ELLIOTT: He says after King was assassinated, preparations continued. High school students would help in the afternoons and then march into town every evening. JOSSEL: To just bring attention that we were tired of living the way we were living. ELLIOTT: Jossel says when students marched to the jail to protest the arrest of an organizer with the Southern Christian Leadership Conference, they were met by armed troopers. JOSSEL: And they parked on this side of the street with their helmets and guns and lined up in a single-file and started marching across the street to where we were. They took the butts of their guns and start swinging at heads and everything. And we scattered like bees. ELLIOTT: Samuel McCray was there, too. SAMUEL MCCRAY: You went at your own risk. ELLIOTT: He says teens like him were more willing to participate than older residents who stood to lose their jobs and homes. MCCRAY: A lot of the parents didn't know there was a better way. You know, yeah, you saw Dr. King and he fighting for all, but then they kill him. So, if they going to kill him, then what about you? ELLIOTT: McCray's grandmother let him help locally but not ride the mule train to Washington. But others filled about 15 covered wagons and set out across the South. Bertha Burres and her six kids were among them. She talked to SCLC photographer Roland Freeman on the trip. He shared those recordings exclusively with NPR. BERTHA BURRES: We have a great purpose, and this is what I am backing all the way. ROLAND FREEMAN: You say you know why we're going and we have a great purpose. Would you mind explaining to me, in your own words, what you think this great purpose is? BURRES: We are in great need of jobs. I need a job that will secure us and help us to bring up our family decently - you know. ELLIOTT: Burres served as the record keeper for the SCLC. She suffers from dementia now. But her cousin, Betty Crawford, is organizing those papers to preserve the history of the mule train. Crawford recently moved back to Marks, living in a house that's very different from her days growing up in a family of 16 battling worm outbreaks and living in sparse housing. BETTY CRAWFORD: I was 16 years old before we got inside plumbing, before we had a house with running water. ELLIOTT: The mule train brought new possibilities, but Marks, Miss. - population 1,500 - still struggles with poverty today. Jim Crow was legally dismantled. And African-Americans have political clout in the Delta. But economic power is more elusive. Farm jobs are mostly mechanized now. And smaller businesses have left downtown. Two major employers here, a cotton compacting plant and a seed oil press, have shut down. More than 34 percent of Quitman County residents live below the federal poverty line. ELLIOTT: Betty Crawford checks on an elderly neighbor around the corner. JULIA MAYWEATHER: Watch out, Betty. ELLIOTT: Julia Mayweather warns her to avoid rotted-out floorboards. MAYWEATHER: I usually kind of get over here. You step over to this side. 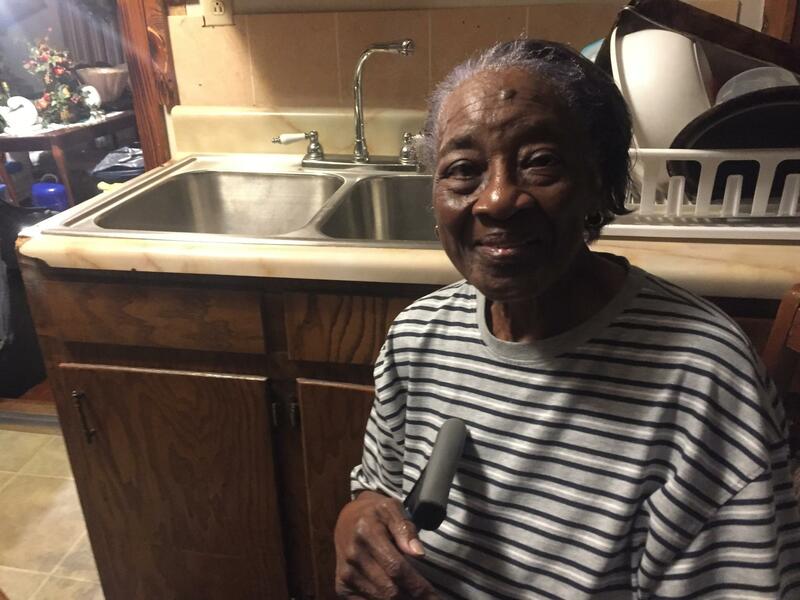 ELLIOTT: A retired school cafeteria worker, Mayweather hasn't been able to keep up with repairs since her husband died. She says Martin Luther King would be disheartened to see Marks today. MAYWEATHER: Because, I tell you what, we don't even have a grocery store in Marks. And I'll tell you another thing - the doctors, too. There's no doctors here. They used to have a hospital. It's gone. ELLIOTT: The hospital and old SuperValu sit empty on the main highway. ELLIOTT: This month, Amtrak added a stop in downtown Marks. It's part of a local strategy to develop the region as a tourist destination. Quitman County Administrator Velma Benson-Wilson says the history of the poor people's campaign has been buried here for too long. VELMA BENSON-WILSON: How can we use it to help Quitman County maybe dig itself out of some of the poverty? There has to be a way. ELLIOTT: She says what started here 50 years ago helped people around the country when Congress passed nutrition and housing programs. BENSON-WILSON: They were all rooted in what started here in Marks in 1968. And somehow we have not been able to tell that story. ELLIOTT: The mule train made it to Atlanta to board a rail train bound for Alexandria, Va. On June 19, the caravan crossed the Potomac and joined thousands of people from around the country to live in a shantytown known as Resurrection City on the National Mall. Debbie Elliott, NPR News, Marks, Miss. Transcript provided by NPR, Copyright NPR.